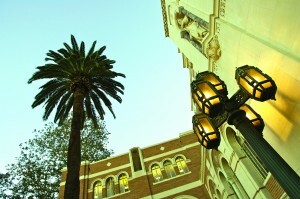 Founded in 1884, the USC Thornton School of Music is the longest-standing cultural institution in Los Angeles. Located in the heart of the city, USC Thornton offers students every advantage of studying, performing, and networking in one of the world’s most vibrant music centers. The school goes much further to blur the lines between campus and city. Thornton students regularly perform at the nearby GRAMMY Museum, and faculty, students, and alumni have performed on the Emmy Awards, as well as the GRAMMY and Academy Awards. Our students have regular opportunities to interact with artists from all major performing disciplines—from on-campus master classes and drastically reduced (or free) tickets to cultural events at the Los Angeles Music Center, to working in the vast number of professional recording studios in Hollywood. USC Thornton faculty are members of the Los Angeles Philharmonic, Los Angeles Master Chorale, Los Angeles Chamber Orchestra, and the LA Opera. Every week, students have meaningful opportunities to engage with leading professionals in all aspects of the music, recording, and entertainment industries. USC Thornton is a collegiate partner of choice for the Los Angeles Philharmonic, LA Opera, Los Angeles Master Chorale, Los Angeles Chamber Orchestra, GRAMMY Foundation, and The Recording Academy. Unique among its peers, USC Thornton strives to be the country’s most relevant music school. We are a community built around, and for, the most outstanding young artists and intellects in the world. If this sounds appealing to you, you belong here with us.